Questo tour visita aziende vinicole e pescherecci su piccola scala, con tutte le degustazioni incluse. Lascia che la tua guida maneggi la guida e si rilassi mentre sorseggi la strada attraverso la regione vinicola della California. Dopo il ritiro mattutino nel tuo hotel di San Francisco, sistemati in un lussuoso pullman dotato di servizi a bordo tra cui un bagno, sedili reclinabili e Wi-Fi. 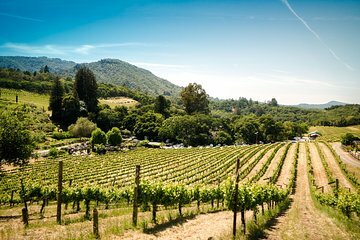 Ascolta le storie dei missionari spagnoli e dei cercatori di fortuna di Gold Rush dalla tua guida mentre navighi attraverso il Golden Gate Bridge e tra le verdi colline e i pascoli della Sonoma Valley. La prima tappa è la Nicholson Ranch Winery, una struttura a conduzione familiare, situata ai piedi delle colline meridionali di Sonoma. Degusta fantastici vini chardonnay, pinot nero e merlot mentre assapori le vedute dei vigneti in dolce pendenza dal patio. 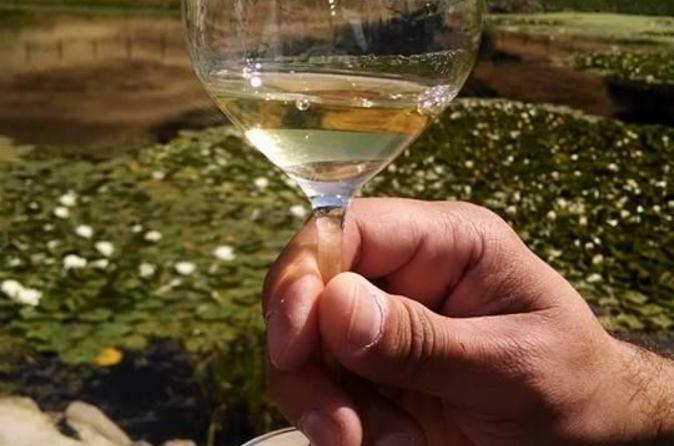 Proseguimento per la famosa Napa Valley per un tour e degustazione presso la tenuta Madonna, un'azienda vinicola a conduzione familiare che produce vini biologici nell'acclamata regione vinicola di Carneros. Concediti il tuo appetito con una sosta per il pranzo (a proprie spese) a Sonoma Square Plaza, una delle più grandi piazze della California, e scegli tra più ristoranti affascinanti. Quindi, è tempo di più vino da Sutter Home, il tuo ultimo fine della giornata. Sorseggiate varietali diversi nella sala degustazione mentre apprendete come questo classico di Napa Valley è cresciuto da una piccola azienda a conduzione familiare alla fine del 1800 a uno dei nomi di vinificazione più noti negli Stati Uniti. Tornate sull'autobus, assaporate il sole del tardo pomeriggio e il bagliore indotto dal vino nel viaggio di ritorno a San Francisco, dove concluderete il vostro tour a Union Square. Nota: a seconda del giorno del tour, l'ordine delle aziende vinicole visitate e le aziende vinicole visitate potrebbero variare in base alla disponibilità e ad altri fattori determinanti. This was an amazing way to see parts of Napa. The tour basically pays for itself with the bus! The places were great, the views were awesome and we got some time to explore! I enjoyed this tour and our tour guide (I've forgotten his name forgive me) was knowledgeable, friendly and overall excellent. I think it would've been nicer to have less time at some of the wineries and to fit in another cellar, simply to have a greater variety of wines to choose from but the three we did visit were lovely. This tour is worth it if you're not familiar with the area and don't want to drive ! We have been to other tours before and had a certain expectation and we were very disappointed. The driver did not speak a good English and he was not knowlagable at all. I expected for him to fill the time on the way their with facts and he failed really badly. We previously went with another company which was a little more expensive and totally worth it. This time they did not have the tour I was looking for on the day I was there so I had to go with another company and what a waist of money. Also the wineries and the wines we tried not very impressive. The tour guide babbled constantly. Did not take us to the third winery the as advertised. Took us to a different one and asked everyone what they thought. Not one person liked it. We didn't get the only known winery on the tour. Someone at that winery told me guides cheat and go elsewhere because they have rules and they don't want to follow the rules. I'm not here to entertain the driver. Then, he dropped everyone else off before going to union square even though the tour says return to hotel not included. Didn't return us to the drop off point at 478 post as i paid for with the purchase price. Left is off an hour and a half late 2 blocks away. It was more convenient for him. Also, on the return trip, we were all sleeping and he wouldn't stop babbling about nonsense into the microphone. We're not here to visit him!!!! Leave us alone. I get providing facts along the way but other than that, please shut up once in a while! Our tour guide and wineries visited were great but because of a passenger who choose to get drunk and use fowl language in the bus made the experience unpleasant for other passengers. Passengers who get drunk should be removed from the bus and turned over to the police. This was a great way to have a relaxing carefree day to Napa. The driver was well knowledgeable and accommodating. Definitely worth the cost! We really enjoyed our tour. The three wineries chosen were excellent and the food recommendations for lunch were outstanding! The Cline and adretti wineries were really great and the tasting guide was really informative. However the guide at sutterhome wasn’t interactive at all. Basically just poured drinks. Still overall a good tour! The wineries were great but the lunch stop was terrible with only 3 options, one of which was fully booked and extremely expensive. Everyone was forced to eat a practically inedible burger and chips.